[www.inewsguyana.com] – A book of condolences has been opened for the late Chairman of the Private Sector Commission (PSC), Ronald Webster at the PSC’s Office on 157 Waterloo Street, Georgetown. 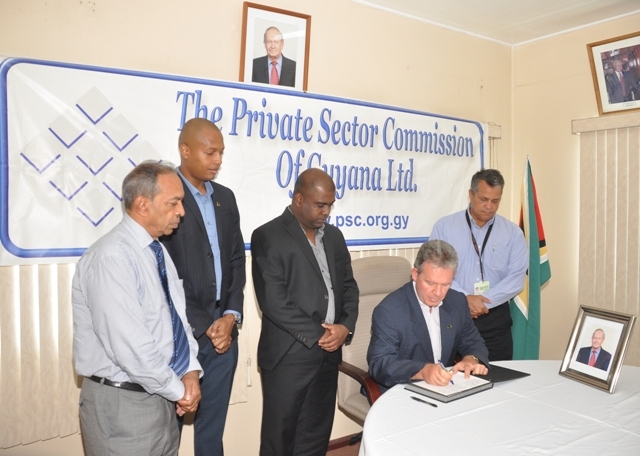 Signing the book on Tuesday morning (April 2) were Vice-Chairman of the PSC, Ramesh Persaud and British High Commissioner, Andrew Ayre. The Book of Condolences will remain open until 4:00 pm today and from 10:00 am to 4:00 pm tomorrow, Wednesday. Webster lost the battle to cancer and died early Sunday morning (April 27) at the Balwant Singh’s Hospital. His death has been deemed as a great loss to the PSC.